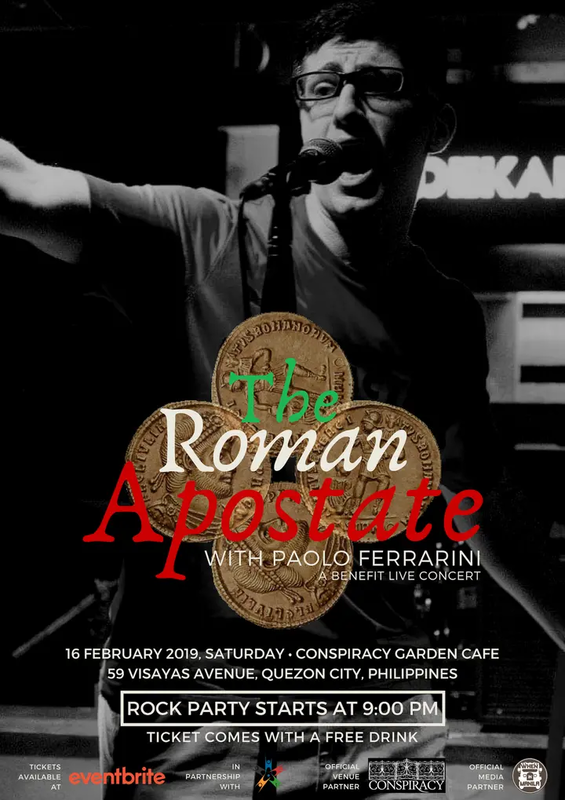 Paolo Ferrarini will rock Manila this February "The Roman Apostate Show"
The London-based Italian cognitive pop rock soloist Paolo Ferrarini is coming live in Manila to celebrate gender diversity and Humanism on February 16, 2019 (Saturday) at 9:00 PM at Conspiracy Garden Cafe. He was a linguist by degree and trade, a solo artist who treats music much like a language. After his "Paradigni Gnoseologici" 2008 debut album and "Prolegomeni a Qualsiasi Metafisica" 2013 album, he took a break for a while to explore cultures. His kind of genre: cognitive rock, combined with sophisticated and in-depth research has attracted listeners of fine and depth reflection kind of music. This month of love, he shall perform for the first time in Manila with the proceeds will going to the needful and indigenous children supported by HAPI - Humanist Alliance Philippines, International. Presented in part by Conspiracy Garden cafe as venue partner and When In Manila as online media partner. General admission cost at PHP250 per person, online ticket comes with a free drink and the show will not allow minors due to the explicit content.